Regency mirror, of satinwood, in the Egyptian Revival style, having twin Egyptian caryatids flanking its rectangular mirrorplate, surmounted by pediment inset with eglomise panel painted with allegorical figures. CONDITION: Excellent antique condition. Minor wear consistent with age and use. Regency mirror, of satinwood, in the Egyptian Revival style, having twin Egyptian caryatids flanking its rectangular mirrorplate, surmounted by pediment inset with eglomise panel painted with allegorical figures. CONDITION: Excellent antique condition. Minor wear consistent with age and use. 1. Acceptance of These Terms: Welcome! This website, www.jamesandjeffrey.com (the "Site," including all subdomains), is a copyrighted work belonging to James and Jeffrey Antiques, Inc. ("we," "us," and "our"). These terms of service (the "Terms") govern your access to and use of the services available on this Site (the "Services"). Specific features of the Site may have additional rules and terms associated with them, and such additional rules and terms will be prominently posted or otherwise made available to each user ("you" and "your") including any entity you represent) and are incorporated herein by reference. PLEASE READ THESE TERMS CAREFULLY. THESE TERMS CONSTITUTE A BINDING LEGAL AGREEMENT BETWEEN YOU AND JAMES AND JEFFREY ANTIQUES, INC. BY USING THIS SITE AND THE RELATED SERVICES YOU UNCONDITIONALLY AGREE TO BE BOUND BY THESE TERMS, INCLUDING ALL EXCLUSIONS AND LIMITATIONS OF LIABILITY HEREIN, AND WARRANT THAT YOU HAVE FULL AUTHORITY AND CAPACITY, LEGAL AND OTHERWISE, TO USE THE SERVICES. YOU MAY NOT ACCESS OR USE THIS SITE OR THE SERVICES IF YOU DO NOT AGREE TO ANY PART OF THESE TERMS. THESE TERMS LIMIT THE REMEDIES AVAILABLE IN THE EVENT OF A DISPUTE AND REQUIRE THAT ALL DISPUTES BE RESOLVED THROUGH BINDING ARBITRATION. THIS MEANS THAT YOU AGREE TO RESOLVE DISPUTES INDIVIDUALLY ACCORDING TO THE ARBITRATION PROVISIONS BELOW RATHER THAN IN A COURT OF LAW OR THROUGH A CLASS ACTION LAWSUIT. You must be at least 18 [eighteen] years of age to use this Site. By using this Site you represent that you are at least 18 [eighteen] years of age. 2. License to Use Website: This Site primarily operates as a(n) e-commerce website. The Site provides an online marketplace to sell goods ("Items") to users wishing to purchase ("Buyer"), and provide relevant information to the public regarding the operation of James and Jeffrey Antiques. Inc. Subject to these Terms, you are granted a personal, worldwide, non-transferable, non-exclusive, royalty-free, limited license to use and access the Site. You must use this license only in the manner permitted by these Terms for the sole purpose of using and enjoying the benefit of the Services provided by the Site. 3. Advertisements: The Services provided may include advertisements, some of which may be targeted based on the type of information on the Site, queries made, or other information, whether submitted by you or others. The types and amount of advertising on the Site or through the Services is subject to change. 5. Acceptable Use Policy: By using this Site you agree to use the Services in compliance with these Terms and all applicable rules and regulations, including the local, state, national, and international laws that apply to your jurisdiction. We are based in Florida, United States. This Site is meant for use by persons within the United States. It may be illegal for certain persons to use the Site in some countries. We make no claim that the Site will be legal or accessible outside of the United States. Subject to these Terms, you may view, print, and use our content and Services as permitted on the Site and only for your own personal, non-commercial use. You further agree and acknowledge that your use of this Site and the Services results in you sending electronic interstate transmissions through our computer network, and such transmissions may include, but are not limited to, any searches, file uploads, posts, instant messages, or emails. m. Harassing, stalking, harming, or otherwise interfering with or negatively affecting another user's normal use and enjoyment of the Site. 6. International Use and Compliance: Due to the global nature of the internet, you understand and agree that it is your responsibility to ensure that your use of the Site complies with all local, international, and other laws that may apply. In addition, United States import and export control laws and the import regulations of other countries may apply to the use of the Site. You agree not to export, upload, post, or transfer, directly or indirectly, any software, technical data, or technology acquired through us, the Site, or the Services in violation of such export or import laws, including, but not limited to, the United States Export Administration Regulations (EAR) and the various United States sanctions programs. 7. Minors: We do not knowingly collect personal information or data from visitors under 13 years of age. You may not use this site if you are under the age of 13 [thirteen]. 8. User Accounts: Visitors to the Site are permitted to create user accounts or profiles. Upon registering for our Services, you are considered a "Member" of the Site. You represent that all information you submit when creating an account is true and accurate, and you promise to update and maintain the accuracy of this information at all times. Each Member is the sole authorized user of his or her account. Members are responsible for keeping their passwords and account access information confidential. Therefore, you should take measures to restrict access to your account and to any devices from which you access your account. As a Member, you are responsible for all activities that occur under your account, and you acknowledge that James and Jeffrey Antiques, Inc. is not responsible for unauthorized access to your account that results from theft or misappropriation of your account or password. Members are prohibited from assigning or otherwise transferring their accounts and passwords to others. You must notify us immediately if you know of or suspect that an unauthorized use or other breach of security of your account or the Site has occurred. We may not be held liable for any loss or damage that may arise from your failure to maintain the security of your account. You may delete your account at any time and for any reason by following the instructions on the Site. We retain the right to suspend or terminate your account at any time and for any reason, as further detailed below. 9. Enforcement of Acceptable Use Policy: We reserve the right to review and investigate your use of the Site and to take any appropriate action against you that we determine is necessary in our sole discretion should you violate these Terms or otherwise create liability, loss, or damage for us, our Site visitors, or a third party. Such action may include, but is not limited to, restricting your account privileges or terminating your account, initiating proceedings to recover any losses and reporting you to law enforcement authorities. 10. Third-Party Resources: The Site may contain links and advertisements to third-party websites and services (collectively, "Third-Party Resources"). You agree and acknowledge that Third-Party Resources are not under our control and we are not responsible for the content, products, or services they provide. We provide access to Third-Party Resources only as a convenience to you and do not monitor, endorse, warrant, or make any representations regarding Third-Party Resources. It is your sole responsibility to exercise appropriate caution and discretion when using Third-Party Resources, and you acknowledge that you assume all risks that arise from such use. 11. Modification of Site: We reserve the right to modify, add to, suspend, or terminate all or part of the Site or Services at any time with or without providing prior notice to you. This includes the right to create limits on our visitors' use of Services and data storage. You agree that we are not liable for using or enforcing the rights stated in this paragraph. Unless we indicate otherwise, any future modifications to the Site are subject to these Terms. 12. Support or Maintenance: Although we may choose to provide customer support or website maintenance, you acknowledge and agree that we are under no obligation to do so. 13. Restricted Access: Some parts of the Site may be restricted to certain visitors. If you have permission to access restricted parts of the Site, you agree to not share your access information and password with third parties. We may change the restricted parts of the Site from time to time. If you do not have access to restricted parts of the Site, you agree not to use another user's account to gain such access or otherwise attempt to gain improper access to the restricted parts of the Site. At times we may need to send you communications related to the Site or the Services. Such communications are considered part of the Services, and you may not be able to opt out of receiving them. We reserve the right to access and disclose the information you submit to the Site if required to do so by law or if we have a reasonable, good-faith belief that doing so is necessary for (i) responding to requests for customer service, (ii) addressing fraud, security, or technical issues, (iii) protecting the rights, property, and safety of James and Jeffrey Antiques, Inc., its users, and the public, (iv) responding to legal claims and processes, or (v) enforcing these Terms, including investigating potential violations. 15. James and Jeffrey Antiques, Inc. Rights and Ownership: Unless otherwise stated, James and Jeffrey Antiques, Inc. and its permitted licensors own all intellectual property rights in the Site and its contents. These rights include, but are not limited to, ownership of all text, graphics, images, logos, copyrighted material, trademarks, patents, software, and other distinctive brand features displayed on the Site or Services, including the compilation of any of the foregoing items. Except for the limited rights granted by these Terms, neither these Terms nor your use or access to the Site give you or any third party any intellectual property rights. We reserve all rights not explicitly granted by these Terms, which do not grant any implied licenses. All copyrights, trademarks, and other intellectual property notices on the Site or Services must be retained on all copies thereof. You may not publish, reverse engineer, modify, distribute, transmit, sell, create derivative or plagiaristic works of, or use or exploit for any commercial reason, whether in whole or in part, any of the content on the Site or Services without our express prior written consent or the consent of any third-party owners of the content. Site content is not for resale under any circumstances. f. A statement that the information in the notification is accurate, and, under penalty of perjury, that you are authorized to act on behalf of the copyright owner. James and Jeffrey Antiques, Inc. Note that pursuant to 17 U.S.C. 512(f), any material misrepresentation in a written notification that content is infringing or that allegedly infringing content was removed by mistake or misidentification automatically subjects the complaining party to liability for damages, including costs and attorney's fees incurred by the alleged infringer, by any copyright owner or copyright owner's authorized licensee, or by us, if injured by such misrepresentation. a. Item Description, Pricing and Availability, Site Unavailability: Every effort is made to ensure the accuracy in describing and pricing the Items on the Site. However, due to the nature of the internet, occasional glitches, service interruptions or mistakes may cause unintended inaccuracies to appear on the Site. We reserve the right to correct inaccuracies or mistakes that come to our attention and to void any purchases of Items that display an inaccurate price or description. You are aware that unless otherwise stated, the Items are not new nor in perfect condition and may require touch-up or repairs prior to use and that the available information about these Items may be limited. b. 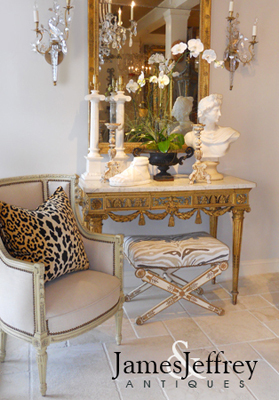 Purchases through Site: When you identify an Item for purchase, you may make an offer to purchase the Item directly through the Site's checkout page or by contacting James and Jeffrey Antiques, Inc. through any method listed on the Site. At that time, you shall submit valid payment information to us for payment of the Total Purchase Price. The "Total Purchase Price" is the price agreed to on the Site and includes (i) the agreed price of the Item (the "Purchase Price"); (ii) if applicable, shipping fees; and (iii) sales tax, use tax, VAT, Internet sales tax and/or any other taxes or levies that the we are required to collect from the user under applicable law at the time of sale. By making an offer to purchase, you irrevocably agree to pay the Total Purchase Price and James and Jeffrey Antiques, Inc. agrees to sell the Item for the Total Purchase Price once a Sale Confirmation is issued to the user. Once made, an offer may not be canceled or revoked by the user unless the offer was made at a time when the Total Purchase Price was yet to be confirmed e.g. because the shipping fees were unknown at the time of placing an offer (and subject to any statutory rights a user may have). All Items displayed on the Site are sold "AS IS". We make no any guarantee, warranty or representation, expressed or implied, to any user with respect to any Item, including without limitation, its condition, merchantability, fitness for a particular purpose, quality, rarity, importance, provenance, designer or creator, exhibitions, literature, historical relevance or otherwise. No statement anywhere, whether oral or written, shall be deemed any such guarantee, warranty or representation. We make no representation or warranty as to whether the user acquires any reproduction rights or other intellectual property rights in any Item that is purchased. c. Taxes and Import/Export Duties: The Buyer is entirely responsible for paying all sales and use taxes, VAT, export and/or import taxes and duties and all transactional taxes or levies related to the purchase of each Item purchased (collectively, "Taxes"). The Buyer shall pay such Taxes as we are required to collect, but our failure to collect the Taxes will not relieve the Buyer's obligation. It is the Buyer's responsibility to establish and/or document any applicable exemption from Taxes. The Buyer must determine, pay, collect, remit and report to the appropriate taxing authority the correct amount of all export and/or import taxes or duties payable upon export of the Item from its country of origin and import into the United States or any other country. d. Shipping: Many of the items have pre-quoted shipping prices for delivery within the Continental US. These prices are only valid for online purchases, at full price. Additional charges may be incurred for delivery to walk-ups, and may incur additional fees based on flights of stairs, or other delivery restrictions (certificates of insurance, restricted delivery hours, special handling, etc). Buyer agrees to alert us to these types of issues at checkout, by using the comments section, and we will contact you to requote shipping cost, if necessary, in order to accommodate the Buyer's circumstances relating to delivery. If the shipping cost is not available during checkout (shipping is priced at $0.00), submitted orders will remain pending until we provide Buyer with a shipping quote customized to your destination for your approval. We will email you the shipping quote within 24 to 48 hours. If you accept the quote, your order will be confirmed, and the piece will be shipped to you. If you reject the quote, your order will be canceled, and you will not be charged. We use both "Standard" and "White Glove" shipping services, depending upon the size of the item. 1. Standard Shipping: Item is carefully packaged and delivered via a parcel delivery service such as UPS or FedEx. Allow 7 to 10 days for delivery. 2. White Glove (Full Service): Delivered to room of choice and includes unpacking and removal of packing materials. Installation is not included. Delivery to walk-ups may incur additional fees based on flights of stairs. Allow 4 to 6 weeks for delivery. If it is not clear which method will be used to ship your item, or if you have any questions concerning shipping, or your order in general, please contact us by telephone at 800-991-3499 or by email at info@jamesandjeffrey.com. 18. Refund Policy: Returns, for refund or store credit, may be initiated within 3 days of delivery by contacting us by telephone at 800-991-3499 or by email at info@jamesandjeffrey.com. You are responsible for the cost of return shipping. Please note, that we do not subsidize the cost of return shipping, so it may be significantly higher than what was charged to ship the item to you. All returns are subject to a 10% restocking fee. Returned merchandise must be prepaid by buyer, carry insurance with zero deductible, and transported by a shipping vendor approved by seller. Returns are not accepted on merchandise damaged during shipment. Photos of merchandise to be returned are required to verify condition, and must be received by seller prior to the items being shipped. Items must be received by seller within 4 to 6 weeks of delivery to be eligible for refund or store credit. We will notify you, by email, once the returned item has been delivered, inspected, and determined that it is in the same condition as when it was sold. YOUR REFUND OR STORE CREDIT WILL BE PROCESSED, LESS BOTH THE 10% RESTOCKING FEE, AND THE ACTUAL COST OF INITIAL OUTBOUND SHIPPING, WHICH MAY BE HIGHER THAN WHAT WAS ORIGINALLY PAID. 19. Disclaimers: THIS SECTION ONLY APPLIES TO THE MAXIMUM EXTENT PERMITTED BY APPLICABLE LAW. THE SITE IS PROVIDED TO YOU ON AN "AS-IS" AND "AS AVAILABLE" BASIS, WITHOUT ANY REPRESENTATIONS OR WARRANTIES WITH REGARD TO THE CONTENT PROVIDED ON THE SITE. WE, OUR SUBSIDIARIES, OFFICERS, EMPLOYEES, CONTRACTORS, AFFILIATES, PARTNERS, SUPPLIERS, AGENTS, AND LICENSORS EXPRESSLY DISCLAIM ANY AND ALL WARRANTIES AND CONDITIONS OF ANY KIND, WHETHER EXPRESS, IMPLIED, OR STATUTORY, INCLUDING ALL WARRANTIES OR CONDITIONS OF MERCHANTABILITY, FITNESS FOR A PARTICULAR PURPOSE, TITLE, QUIET ENJOYMENT, ACCURACY, OR NON-INFRINGEMENT. THIS INCLUDES, WITHOUT LIMITATION TO THE FOREGOING, NO WARRANTY THAT THE SITE, ITS CONTENT, OR THE SERVICES WILL BE CONSTANTLY AVAILABLE OR AVAILABLE AT ALL, UNINTERRUPTED, USEFUL, TRUE, ACCURATE, NON-MISLEADING, TIMELY, RELIABLE, COMPLETE, ERROR-FREE, FREE OF OMISSIONS, SECURE, FREE OF VIRUSES OR OTHER HARMFUL CODE, LEGAL, OR SAFE. NO INFORMATION, WHETHER ORAL OR WRITTEN, OBTAINED FROM US OR THROUGH THE SITE OR SERVICES WILL CREATE ANY WARRANTY NOT EXPRESSLY MADE HEREIN. YOUR USE OF THIS SITE AND THE SERVICES IS AT YOUR SOLE RISK AND WE ASSUME NO RESPONSIBILITY FOR HARM TO YOUR COMPUTER SYSTEM, LOSS OF DATA, THE DELETION OF INFORMATION YOU TRANSMIT ON THE SITE, OR THE DELETION OR FAILURE TO STORE OR TRANSMIT USER CONTENT OR PERSONALIZATION SETTINGS THAT MAY RESULT FROM YOUR ACCESS TO OR USE OF THE SITE AND SERVICES. YOU HEREBY WAIVE ANY AND ALL CLAIMS AND CAUSES OF ACTION THAT MAY CAUSE DAMAGE TO YOUR COMPUTER OR INTERNET ACCESS. THIS SITE AND ITS CONTENTS ARE PROVIDED FOR INFORMATIONAL PURPOSES ONLY. NOTHING ON THIS SITE CONSTITUTES, IS MEANT TO CONSTITUTE, OR MAY BE USED AS ADVICE OF ANY KIND, INCLUDING, BUT NOT LIMITED TO, LEGAL, FINANCIAL (INCLUDING TRADING OR INVESTMENT PURPOSES), OR MEDICAL ADVICE. WE ENCOURAGE YOU TO CONSULT THE APPROPRIATE PROFESSIONAL SHOULD YOU REQUIRE LEGAL, FINANCIAL, MEDICAL, OR OTHER PROFESSIONAL ADVICE. IF APPLICABLE LAW REQUIRES ANY WARRANTIES WITH RESPECT TO THE SITE, ALL SUCH WARRANTIES ARE LIMITED IN DURATION TO NINETY (90) DAYS FROM THE DATE OF FIRST USE. SOME JURISDICTIONS DO NOT ALLOW THE EXCLUSION OF IMPLIED WARRANTIES, SO THE ABOVE EXCLUSION MAY NOT APPLY TO YOU. SOME JURISDICTIONS DO NOT ALLOW LIMITATIONS ON HOW LONG AN IMPLIED WARRANTY LASTS, SO THE ABOVE LIMITATION MAY NOT APPLY TO YOU. NOTHING IN THIS SECTION IS INTENDED TO LIMIT ANY RIGHTS YOU MAY HAVE WHICH MAY NOT BE LAWFULLY LIMITED. 20. Limitation of Liability: TO THE MAXIMUM EXTENT PERMITTED BY APPLICABLE LAW, JAMES AND JEFFREY ANTIQUES, INC., INCLUDING ITS SUBSIDIARIES, OFFICERS, EMPLOYEES, CONTRACTORS, AFFILIATES, PARTNERS, SUPPLIERS, AGENTS, AND LICENSORS, MAY NOT BE HELD LIABLE FOR ANY INDIRECT, INCIDENTAL, SPECIAL, CONSEQUENTIAL, OR PUNITIVE DAMAGES, OR ANY LOSS OF PROFITS OR REVENUES, WHETHER INCURRED DIRECTLY OR INDIRECTLY, OR ANY LOSS OF DATA, USE, GOOD-WILL, OR OTHER INTANGIBLE LOSSES, RESULTING FROM (i) YOUR ACCESS TO OR USE OF OR INABILITY TO ACCESS OR USE THE SERVICES; (ii) THE COST OF PROCURING SUBSTITUTE GOODS OR SERVICES; (iii) ANY CONDUCT OR CONTENT OF ANY THIRD PARTY ON THE SERVICES, INCLUDING WITHOUT LIMITATION, ANY DEFAMATORY, OFFENSIVE, OR ILLEGAL CONDUCT OF OTHER USERS OR THIRD PARTIES; (iv) ANY CONTENT OBTAINED FROM THE SERVICES; (v) UNAUTHORIZED ACCESS, USE, OR ALTERATION OF YOUR TRANSMISSIONS OR CONTENT; OR (vi) OTHER MATTERS RELATED TO THE SITE OR SERVICES. THESE LIMITATIONS APPLY EVEN IF WE HAVE BEEN EXPRESSLY ADVISED OF THE POTENTIAL LOSS OR LIABILITY. NOTWITHSTANDING ANYTHING TO THE CONTRARY CONTAINED HEREIN, IN NO EVENT MAY OUR AGGREGATE LIABILITY EXCEED THE GREATER OF ONE HUNDRED U.S. DOLLARS (U.S. $100.00) OR THE AMOUNT YOU PAID US, IF ANY, IN THE PAST SIX MONTHS FOR THE SERVICES GIVING RISE TO THE CLAIM. THE EXISTENCE OF MORE THAN ONE CLAIM WILL NOT ENLARGE THIS LIMIT. YOU AGREE THAT OUR AFFILIATES, PARTNERS, SUPPLIERS, AGENTS, AND LICENSORS WILL HAVE NO LIABILITY OF ANY KIND ARISING FROM OR RELATING TO YOUR USE OF THE SITE OR SERVICES. YOU FURTHER AGREE NOT TO BRING ANY CLAIM PERSONALLY AGAINST OUR SUBSIDIARIES, OFFICERS, EMPLOYEES, CONTRACTORS, AGENTS, AFFILIATES, PARTNERS, SUPPLIERS, OR LICENSORS. THE LIMITATIONS IN THIS SECTION APPLY REGARDLESS OF THE THEORY OF LIABILITY, WHETHER BASED IN CONTRACT, TORT (INCLUDING NEGLIGENCE), WARRANTY, STATUTE, OR OTHERWISE. NOTE THAT SOME JURISDICTIONS PROHIBIT THE LIMITATION OR EXCLUSION OF LIABILITY FOR INCIDENTAL OR CONSEQUENTIAL DAMAGES, AND THEREFORE THE LIMITATIONS AND EXCLUSION ABOVE MAY NOT APPLY TO YOU. THE FOREGOING DOES NOT AFFECT ANY LIABILITY THAT CANNOT BE EXCLUDED OR LIMITED UNDER APPLICABLE LAW. 21. Indemnity: You agree to indemnify, defend, and hold harmless James and Jeffrey Antiques, Inc. and its subsidiaries, officers, employees, contractors, agents, affiliates, partners, suppliers, and licensors, including, but not limited to, costs and attorney's fees, from any claim or disputes by a third party arising out of your use of the Site, violation of these Terms, violation of applicable law, or your posting, modifying, or otherwise transmitting content through the Site or Services. We reserve the right, at your expense, to assume exclusive control over the defense of any claim or dispute for which you must indemnify us. You agree to cooperate fully with us in defending such claims or disputes, and you agree not to settle any such claims or disputes without our prior written consent. We will make a reasonable effort to provide you with notice of any such claim or dispute once we receive notice. 22. Release: In the event you have a dispute arising out of, directly or indirectly, these Terms or your use of the Site or Services, you hereby release and forever discharge us, including our subsidiaries, officers, employees, contractors, agents, affiliates, partners, suppliers, and licensors, from all related claims, actions, demands, disputes, damages, and liabilities, whether past, present, or future. IF YOU ARE A CALIFORNIA RESIDENT, YOU HEREBY WAIVE CALIFORNIA CIVIL CODE SECTION 1542 IN CONNECTION WITH THE FOREGOING, WHICH STATES: "A GENERAL RELEASE DOES NOT EXTEND TO CLAIMS WHICH THE CREDITOR DOES NOT KNOW OR SUSPECT TO EXIST IN HIS OR HER FAVOR AT THE TIME OF EXECUTING THE RELEASE, WHICH IF KNOWN BY HIM OR HER MUST HAVE MATERIALLY AFFECTED HIS OR HER SETTLEMENT WITH THE DEBTOR." 23. Termination: We may suspend or terminate your access to the Site at any time and for any reason or no reason at all, with or without notice, at our sole discretion. This may result in deletion of information associated with your account. You may also terminate your account by deactivating it or by submitting a termination request and discontinuing your use of the Services. Your account may be deactivated if it experiences a prolonged period of inactivity. Where applicable, all rights and responsibilities of the parties under these Terms will survive the termination of this agreement, including, without limitation, intellectual property ownership, warranties, disclaimers, and limitations of liability. 24. Modification of These Terms: We may modify or update these Terms from time to time at our sole discretion. All updates will be effective from the time and date that they are posted. We recommend checking this page regularly for any updates. Your continued use of the Site and Services signifies your acceptance of the updates that occur. We may send you notice of updates to these Terms, including, but not limited to, by email, posting on the Site, or other reasonable means. 25. Violations of These Terms: Should you breach these Terms, we may take any and all actions we deem appropriate in our sole discretion under the circumstances, including, but not limited to, suspending, blocking, or terminating your access to the Site and Services and your account. 26. Dispute Resolution: Unless both parties agree otherwise, you and James and Jeffrey Antiques, Inc. agree that any dispute, claim, or controversy you may have arising out of or relating to the Site, Services, or these Terms will be resolved through mandatory binding arbitration administered by the American Arbitration Association (AAA) in accordance with its Commercial Arbitration Rules, and the judgment of its arbitrator(s) may be entered by any court of competent jurisdiction. You further agree that the U.S. Federal Arbitration Act governs the interpretation and enforcement of this provision, and THE PARTIES FURTHER AGREE THAT EACH IS WAIVING ITS CONSTITUTIONAL RIGHT TO A TRIAL BY JURY AS WELL AS THE RIGHT TO BRING OR PARTICIPATE IN A CLASS ACTION OR MULTI-PARTY ACTION. ALL CLAIMS AND DISPUTES RELATED TO YOUR USE OF THE SITE OR SERVICES OR ARISING UNDER THE TERMS MUST BE ARBITRATED OR LITIGATED ON AN INDIVIDUAL BASIS AND NOT ON A CLASS BASIS. ANY DISPUTE, CLAIM, OR CAUSE OF ACTION THAT YOU MAY HAVE ARISING OUT OF OR RELATING TO THE SITE, SERVICES, OR THESE TERMS MUST BE COMMENCED WITHIN ONE YEAR AFTER THE CAUSE ACCRUES; OTHERWISE, SUCH CAUSE OF ACTION WILL BE PERMANENTLY BARRED. This provision will survive the termination of this agreement and the termination of your account. You and James and Jeffrey Antiques, Inc. agree that we may seek injunctive or other appropriate relief in the appropriate state or federal court should you violate or threaten to violate the intellectual property rights of us or our subsidiaries, affiliates, partners, suppliers, or licensors, and you consent to exclusive jurisdiction and venue in such courts. In the event that these Terms are translated into other languages and there is a discrepancy between the two language versions, the English language version will prevail in all cases to the extent that such discrepancy is the result of an error in translation. b. Waiver and Severability: Our failure to enforce any right or provision of these Terms will not operate as a waiver of such right or provision. If any provision of these Terms or the application thereof is held to be invalid or unenforceable for any reason and to any extent, that provision will be considered removed from these Terms; however, the remaining provisions will continue to be valid and enforceable according to the intentions of the Parties and to the maximum extent permitted by law. If it is held that any provision of these Terms is invalid or unenforceable, but that by limiting such provision it would become valid and enforceable, then such provision will be deemed to be written, construed, and enforced as so limited. c. Assignment: Your rights and obligations under these Terms, including any accounts, profiles, or personalization settings you may have, may not be assigned, subcontracted, delegated, or otherwise transferred by you without our prior written consent, and any attempt to do so will be null and void. We may freely assign these Terms and our rights and obligations hereunder without notice to you, and these Terms will continue to be binding on assignees. d. Cumulative Rights: The rights of all parties under these Terms are cumulative and will not be construed as exclusive of each other unless otherwise required by law. e. Law and Jurisdiction: These terms shall be governed by, and will be construed under, the laws of Florida, United States, without regard to or application of its conflict of law principles or your state or country of residence. All claims, disputes, and legal proceedings related to or arising out of these Terms or your use of the Site or Services will be brought exclusively in the federal or state courts located in Florida, and you hereby consent to and waive any objection of inconvenient forum as to such jurisdiction. 28. Electronic Communications: Electronic communications occur whenever you use the Site or Services, you send us emails, we send you emails, and we post notices on the Site. You consent to receive such electronic communications and agree that the electronic communications, including, without limitation, all notices, terms, disclosures, and agreements, has the same legal effect and satisfy any legal requirement that such communications would satisfy if provided to you in a written hardcopy. 29. Feedback and Complaints: You hereby assign to us all rights in any feedback or complaints you provide us concerning the Site or Services and agree that we have the right to use and fully exploit all such feedback or complaints in any manner we wish, commercial or otherwise. We will treat all such feedback or complaints as non-confidential and non-proprietary. Do not provide us with any feedback or complaints that you consider confidential or proprietary. If you are a California resident, you may report complaints to the Complaint Assistance Unit of the Division of Consumer Product of the California Department of Consumer Affairs by contacting them in writing at 400 R Street, Sacramento, CA 95814 or by telephone at (800) 952-5210. Information by which you may be personally identified, such as your name, address, email address, phone number, billing and credit card information, and other information that may not be publicly available ("personal information"). Information about you that does not identify you personally, including, but not limited to, your personal interests, online interactions, viewing data, requests for Services, communications with us and third parties, advertisement interactions, and any other activities when using the Site or the Services. Information you provide when you register with the Site and the Services, when adding or updating account preferences, and when subscribing for any Services. Information about your transactions using the Site and the Services, including, but not limited to, your purchases and order history. We may combine information you provide us with other information about you that we obtain from your past use of the Site and Services, from our business partners, and from other companies. We may access other information about you collected from third parties, such as social media and marketing companies. We will treat any non-personal information that is combined with personal information as if it were all personal information. Log file information commonly collected by host servers when you visit websites, including internet protocol (IP) addresses, browser type, Internet Service Provider (ISP), date and time stamps, referring/exit pages, domain names, landing pages, pages viewed, click counts, and similar information. This information is not connected to personal information and is used for purposes of administering the Site, analyzing trends, tracking visitor activity, and collecting demographic data. Other details regarding your activities on the Site and Services, including your equipment, operating system, software, traffic information, and location data. We do not track visitors' activities over time or across third-party websites and therefore do not respond to Do Not Track (DNT) signals. However, many third-party websites track your browsing activities in order to tailor advertisements and other content to your interests. If you do not wish to be tracked in this manner, then you should configure your browser settings appropriately. To administer the Site and enforce our rules and policies. To provide access to Site content and Services to you. To customize Site content and Services according to your preferences. To improve the Site and Services. To research and analyze the usage data, preferences, and trends of our visitors. To diagnose technical or Service-related problems. To maintain security over your information, the Site, and its contents. To fulfill any requests for information, products, or Services. To facilitate transactions you make on the Site or Services, which may include sending payment statements or receipts, or assisting with payment collection. To send you marketing communications, such as information about new products, Services, or specials. To contact you regarding Services we provide you. To contact you regarding your account or profile. To carry out our responsibilities and enforce any contracts between you and us, including billing and collection rights. For any other use as we may indicate at the time you provide the information. To fulfill any other purpose with your consent. All information collected from visitors of the Site belongs to us, whether or not such information is personal information, information you volunteer, or information passively collected about you. As such, such information may be subject to transfer to a new owner in the event of our bankruptcy, sale, or liquidation. With our affiliates, including any subsidiaries we now own or later acquire. With our trusted employees, contractors, business partners, service providers, suppliers, vendors, and other third parties that support us, which may include sending you emails on our behalf; analyzing your activities and interactions on the Site in order to make improvements to the Site, Services, and experiences of our visitors; and providing support to the Site, the Services, our operations, or fulfilling your requests. These third parties may only use personal information in order to provide such support and are contractually required to maintain the confidentiality of your information. For example, we may share personal information with credit card processing companies in order to bill visitors for goods or services. With those that we so indicate at the time you provide the information. To third parties when we have your consent or when we have parental consent if the visitor is a minor. We may store personal information in locations outside of our direct control; for instance, on servers or databases where the hosting provider is located. Additionally, we may share or sell aggregate information about our visitors that does not personally identify individuals with our partners, affiliates, advertisers, and other third parties without restriction. This information may include personal information that we have changed so that individuals are no longer personally identifiable. We may also share this information with third parties in order to analyze visitor data, activities, and usage of the Site or Services in order to make improvements to the Site, Services, and experiences of our visitors. If you choose to participate in any promotions or similar events through the Site or Services, the rules or terms and conditions for such events may change the way we share your information with third parties. Please review the applicable rules or terms and conditions for all such events in which you participate. Email. Send an email to info@jamesandjeffrey.com explaining the specific communications or privacy practices you want to opt out of. You may also opt out by clicking "unsubscribe," or a similar button, at the bottom of any emails we may send you and then following the online instructions. However, please note that it may not be possible to opt out of certain emails (for example, confirmation emails related to services you have requested). Cookies. In order to opt out of cookies and other tracking technologies, you can configure or disable cookies in your browser settings. However, please note that doing so may cause parts of the Site to function improperly. You are responsible for keeping any personal information you provide on the Site current. Please email us at info@jamesandjeffrey.com to request access to view, correct, or delete information you have provided to us. We will make reasonable efforts to comply with your requests, if possible. If you provided personal information in connection with a specific Service we provide, you may have to update or delete that information by returning to that Service page. Any requests to delete your information are subject to our internal reporting and retention policies as well as any legal obligations that we may have. You can also update or delete some or all of your personal information in your account by signing in, visiting your account page, and configuring the relevant settings. Pursuant to California Civil Code Section 1798.83, California residents who use our Site may request certain information regarding any disclosure of personal information to third parties for their direct marketing purposes. To make this request, please email us at info@jamesandjeffrey.com or use the contact information provided below at the end of this policy. Should you choose to email us, please include in the subject line or body of your email the phrase "California Customer Choice Privacy Notice" and specify the personal information you do not wish to be shared with third parties for their direct marketing purposes. Please allow up to thirty (30) days for a response. We take the security of your information seriously and have electronic, physical, and administrative safeguards in place that comply with federal regulations for your protection. These security measures seek to protect your information both online and offline from disclosure, alteration, or unauthorized use. However, please keep in mind that no transmission of data over the internet is guaranteed to be completely secure. Third parties may be able to access private communications illegally; for instance, through the use of hacking and viruses. As such, all information you transmit on the Site or Services is at your own risk. We are not responsible for instances where third parties circumvent our security measures without authorization, illegally or otherwise. The information you submit to us is encrypted using Secure Sockets Layer (SSL) data encryption technology and is transmitted securely. You may verify this by locating "https" at the beginning of the address of the webpage or an icon of a closed lock in your browser. The computers and servers we use are also kept in a secure environment behind firewalls. We limit access to your information to those people that need to view it to perform necessary support tasks, including fulfilling your requests. We also require you to create a unique password to help secure your account. It is your responsibility to maintain the secrecy of your password and other login information. We will promptly notify you in the event that personal information becomes compromised according to our notification procedures outlined below or as otherwise required by applicable law. This Site does not knowingly collect personal information from children under 13 years of age. If you are under 13 years of age, do not use this Site or provide any personal information to us. We will delete all information that we discover is provided by children under 13 years of age without verification of parental consent. Please email us at info@jamesandjeffrey.com if you believe we have received personal information from a child aged under 13 and we will use our best efforts to remove such information. Your personal information may be processed and transferred to countries other than your own, including, but not limited to, any country in which we operate. Some of these countries may have different laws and practices regarding data protection than your country. By using the Site, you agree to such cross-border transfers of your personal information. Be the first to know about our latest arrivals and exclusive events. You're in good hands, we'll never share our list.